From your first prenatal visit, your midwife is assessing your particular risk level for a home birth. Midwives partner with you to have a healthy pregnancy and encourage you to eat well, exercise, relax and get good sleep. While we can’t control some outcomes, even if we “do everything right,” we can lower the chances that something will go wrong in the birth if we are mindful about our self-care. (This goes for pregnancy and all of life, including for midwives!). Learn all you can about natural childbirth so that you can understand the process, and anticipate a likely course of events. Many families do this by reading books. I link to many of the now vintage books I read as a newly pregnant person in this post. Many of those books have been updated recently, and are still excellent resources. Many care providers maintain a lending library of books for expecting parents. Additionally, seek out an in-person childbirth class specifically focused on preparing for un-medicated births, that you are your partner can attend together. Ask your midwife for local recommendations. Midwives and other practitioners who work according to the Midwives Model of Care tend to avoid unnecessary intervention, which is another facet of preventing complications. Consumer Reports has done a nice job of summing up some of the biggest interventions that are high risk as well as costly for mothers and babies. In short, interventions introduce additional risk. Sometimes that risk is warranted, as in the case of a mother or baby in distress, but many times that additional risk could be avoided. 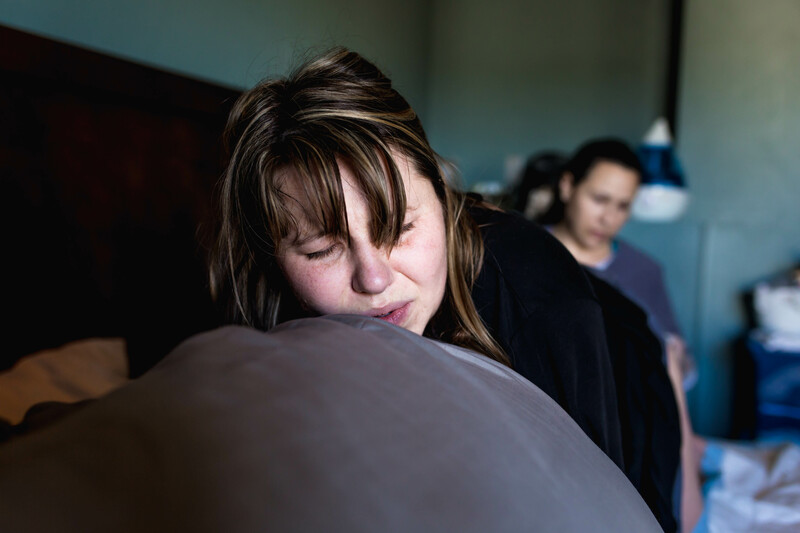 As a partner in your own care, you can ensure that home birth is a reasonable option for you by being honest with your care provider about your health and reproductive history, your lifestyle, and the things that you feel worried or concerned about. Appointments with home birth providers are typically scheduled for 45 minutes to an hour. This relaxed schedule allows you plenty of time to share all of your concerns. If concerns arise during the course of your care, your midwife will help walk you through all of your options. This involves thoroughly covering the risks and benefits of each possible decision. You and your partner can feel confident that you are making a decision that is right for your unique family, and not just something that is done because of a protocol. Seasoned home birth families cite the peaceful and undisturbed environment of their own home as one of the major benefits of home birth. There is no stressful car ride to your planned place of birth because you’re already there. As a midwife, I love being able to just tuck everyone into their own beds after the birth. You do not have to go out into the world with your newborn. You are in a peaceful cocoon of your own home, surrounded by your familiar things. No one wants to think about possible complications. Some people even believe that if we talk about complications we will somehow invite them to happen. However, it seems reasonable to consider this topic carefully when deciding and planning on a home birth. Preparing for something doesn’t assume it will happen. Rather, it allows us the freedom to relax and release that worry, and also for us to feel confident if something unforeseen does happen. Home birth providers are trained in dealing with the typical complications that could happen during birth. Possible events include bleeding, shoulder dystocia (baby being stuck after the birth of the head), perineal tears, and a newborn needing help to breathe. Midwives carry an array of supplies to assist in the management of these possible outcomes, such as anti-hemorrhagic medications, IV supplies, resuscitation equipment, and suturing supplies. Check with your midwife about her personal equipment, skills, and supplies. Planned home birth with a skilled care provider is a reasonable and safe option, with excellent outcomes. You and your midwife can confirm together that you are a low-risk candidate for a home birth during your prenatal visits. Home birth is a reasonable plan for a healthy, low-risk client. Prenatal care includes lab tests and ultrasounds appropriate for your situation. Transfer of care to a higher level provider with more equipment and tools at their disposal may become necessary at any time in your pregnancy, during labor or in the postpartum. There may be something that comes up in your care that requires your midwife to consult with a hospital-based provider, or requires you to be seen by that provider. This may impact the decision to birth at home. Ultimately, everyone’s goal is to have a healthy outcome for mother and baby. Even if it has always been your dream to birth at home, a hospital birth may be the most reasonable option for you. Transfer during labor or in the immediate postpartum may become necessary, and requires safe transport for mother and/or baby if the birth has already been accomplished. Clients should consider this a possible outcome, and participate in the planning of potential transfer by identifying the closest hospital, and finding out what ambulance company serves your area. What happens if the cord is around the baby’s neck? I really like this article about this topic. Long story short, a cord around the neck is very common, found in about 1/3 of babies. Dr. Rachel Reed has done a thorough review with a thoughtful analysis of this topic. It may be that around the neck is a safe place for the cord to be, so that it doesn’t get compressed while the head is coming through the birth canal. Hopefully, you feel reassured and confident in planning a home birth, as well as managing possible complications. Feel free to post questions in the comments. Next: What about the mess?